Calgary-East MLA Robin Luff was removed from government caucus Monday evening after saying she'll refuse to sit in the legislature to protest what she called "a culture of fear and intimidation" within the NDP government. Calgary-East MLA Robyn Luff was removed from government caucus Monday evening after saying she'll refuse to sit in the legislature to protest what she called "a culture of fear and intimidation" within the NDP government. "Owing to Ms. Luff's actions, NDP MLAs have lost confidence in her ability to participate as a productive and trustworthy member of the government caucus," the NDP said in a news release, noting the decision was made during a meeting of NDP MLAs in Edmonton. In a letter sent to the media Monday morning, Luff said the caucus prevents members from properly representing their constituents. In her letter, she said Albertans are poorly served by a system that requires MLAs to vote party lines in all cases, where questions are pre-written by ministries and even statements and questions in committee meetings are scripted. Following the party's announcement that Luff was no longer a member of caucus, the MLA took to Twitter Monday night to accuse the government of censorship. She added that she plans to release a statement Tuesday. Only two voices are heard in the legislature, she said: the approved official NDP message and the Official Opposition UCP message. "It leads to hyper-partisan rhetoric, and to no actual debate on bills," Luff said. "Everything that happens in the house is predetermined, rendering everything that happens there to [be] nothing more than a vehicle for scoring partisan points. It makes a mockery of the proceedings. "Because of the toxic culture that exists, I don't believe that the citizens of Alberta are being represented properly." Luff said MLAs who try to go against these directives face isolation and the fear that their nomination papers will not be signed. "I have had member's statements taken away, and private members bills edited till they weren't what I intended," she wrote. "I have had to fight for months for the ability to ask my own question in QP, and have been questionably removed from a committee. "I have been told by a cabinet minister that my career was sidelined for not jumping when a chief of staff told me to and that the interaction was used as an example of what not to do as an MLA." Luff said she will boycott the legislature until "a resolution has been presented." Her letter did not indicate what that resolution will say or who will present it. Government house leader Brian Mason said the premier's office has spoken with Luff over the past few days to address her concerns. He denied that Luff was bullied. "I don't think that is a fair characterization," Mason said. "People are permitted to speak their minds, and they have an opportunity to do that." Mason said Luff has a duty to be in the house when the legislature is sitting. Calgary-MacKay-Nose Hill MLA Karen McPherson, now a member of the Alberta Party caucus, said she faced a similar experience before she left the NDP caucus in October 2017 to sit as an independent. McPherson joined the Alberta Party several weeks later. "I can certainly understand where Robyn's coming from," McPherson told reporters. "Feeling bullied for sure ... I can certainly corroborate a lot of what she had to say." McPherson said other NDP MLAs had the same experience. She said it is too early to talk about whether Luff will cross to the Alberta Party. United Conservative Party house leader Jason Nixon called Luff's allegations "shocking and extremely alarming." 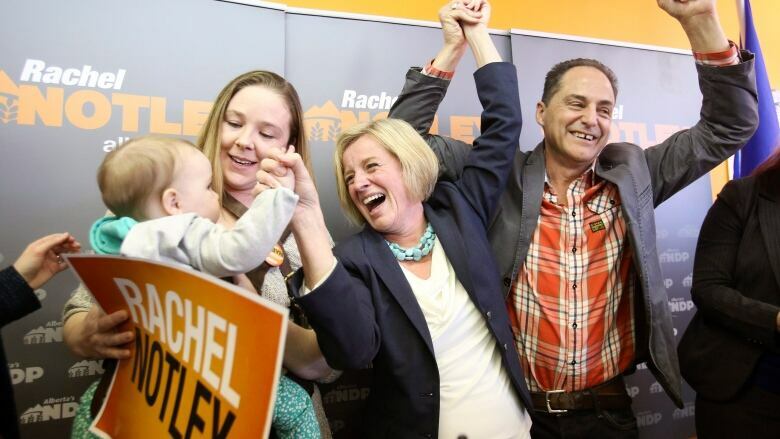 "We have a female member of the legislature who represents almost 50,000 Calgarians, who feels she cannot go into the chamber to do her job because she's being bullied so bad by NDP leadership," he said. Luff was first elected to the Alberta legislature in May 2015. She has not said whether she plans to run for re-election next spring.